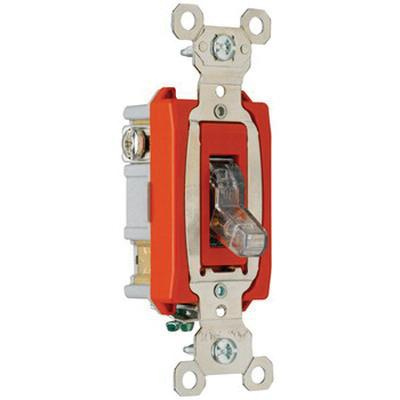 Pass & Seymour 1-Pole Extra heavy-duty pilot light switch in clear color, is rated at 120-Volt AC and 20-Amps. It has maximum load capacity of 1 hp at 120-Volt AC and 2 hp at 240-Volt AC. This industrial specification grade switch features glass reinforced nylon back body. It measures 3.281-Inch x 1.32-Inch x 1.073-Inch. Snap action switch with back and side-wired connection, accommodates terminal of size 14 - 10-AWG. Locking support of this switch offers resistance to face and back body separation. Auto-ground clip ensures positive ground. Switch features shallow design to ensure ease of installation. It withstands dielectric strength of 1500-Volts. Box mount switch features silver cadmium-oxide contact to offer long life, prevent sticking, welding and excessive pitting. It is suitable for use in industry, health care, education and institution. It features nickel-plated brass strap. It withstands temperature rating of -40 to 115 deg C. Switch is UL listed, CSA certified and meets Federal specification/NEMA standards.